You can gain a keen insight on why we are in a buyer's market by studying the current graph of the average home price in Tallahassee, Florida. The cost of new construction continues to rise, while the same cannot be said for existing home sales. This means that there is a growing void between what builders are providing versus what can be found among those homeowners who simply need to move. 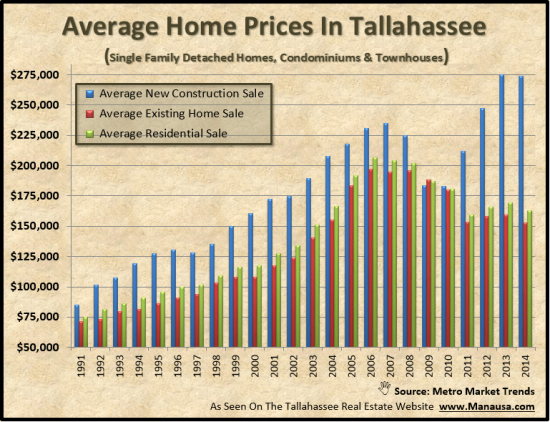 The following real estate graph shows average home prices in Tallahassee. In the graph above, average new construction prices are shown in blue, while the average existing home sale price is shown in red. The overall average home price is shown in green. These figures include single family homes, condominiums, and townhouses. Note how the blue lines are on a fairly consistent rise, from 1991 though 2014. I believe this reflects the fact that regardless of supply and demand, new construction costs continue to rise. But the resale market very much responds to supply and demand. That is why the average resale price (existing home sales) has not changed much in the past four years. So how do we use this information to gain an advantage? Currently, new construction represents about 11% of the market. This is roughly half of what we have experienced over the past 23 years. This lowered demand for new construction is due to the significant price difference between new and used. With new prices averaging just below $274K and existing prices coming 44% lower at $153K, you can see why new construction is not producing the units we have been accustomed to seeing. Expect this trend to continue for the foreseeable future. So long as builders do not glut the market with inventory, they will be able to produce homes for those buyers who demand new construction. But take a look at the blue lines in the graph from 2008-2010 and you'll see what happens when builders have to liquidate at levels below profitability. If you are thinking about buying a home in Tallahassee, make sure you engage the services of a professional buyer's agent. You'll know you are in good hands when they urge you to exhaust the existing home inventory before taking a look at new construction. Of course, we would love to help. You can always drop me a note to set up an initial home buying consultation to help you get the best deal possible in the Tallahassee real estate market.